Minor shortcomings aside, the Gear4Music 200W Lightweight Powered Mixer Head is a versatile bit if kit that is well worth the money. Good, loud and punchy sound. Dedicated monitor buss. Tough, lightweight enclosure. Mono-only effects loop. EQ band clip indicators can be misleading. Misleading label for the auxiliary input. Mixer amps, aka powered mixer heads, fill an important niche in the PA market. They are ideal for soloists and small bands, as well as offering a good solution for small installations in pubs, churches, and such like. A common shortcoming of mixer amps (and here we are creating a notional distinction from a powered mixer, that is, a traditional mixing desk with a built-in power amp), is that they tend to be mono affairs. This is not necessarily a problem in many live circumstances, but far from ideal if you intend to play stereo-mixed music through the system. Not so the new AE72G mixer head from Gear4Music. 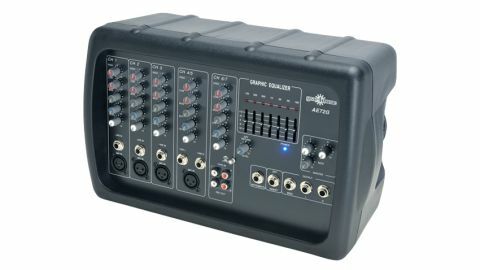 The AE72G offers an unusual total of seven input channels - three mono and two stereo pairs - with all input connectors located on the front fascia. Each channel features high and low EQ, a monitor send, an effects send, and a channel volume control. The mono channels offer both line and mic inputs, on jack and XLR sockets respectively. The first stereo channel (channel 4&5) has a pair of jack socket inputs for line-level stereo signals such as keyboards and synths, as well as a mono mic input. The second stereo pair (channel 6&7) is fed by a pair of RCA/phono sockets and is intended for connecting a playback device (CD, MP3, etc,). Below channel 6&7's inputs is a second pair of RCA/phono sockets that serve as a recording output. Despite being located in the channel 6&7 block, these carry a line-level signal of the entire mix. The master section features a seven-band graphic EQ. This affects both the headphone output and the main powered and line outputs but, very sensibly, not the recording output. Further controls are provided for effect return level, left and right output levels, and monitor output level. Below these controls are connectors for the external effects loop, the monitor output, the pair of line-level outputs for the main L-R buss, and the misleadingly labelled 'Instrument' input. This last is actually a stereo line-level auxiliary input, not a guitar or bass input as is implied by the label. The amp's enclosure is almost certainly a repurposed speaker cabinet, replete with a speaker pole mounting point (albeit with a plug in it). We don't have a problem with this: it looks smart, ensures the cabinet is tough and hard-wearing, and re-using existing components can be a great way of reducing cost without compromising quality. It is important for a PA system to be tough enough to stand up to the demands of life on the road. The first consideration is often portability, especially for solo artists, and on this front the AE72G doesn't disappoint. The unit is small without being cluttered, is lightweight, and has a built-in recess on the right-hand face of the enclosure that acts as a carry handle. The next consideration is durability: will it stand up to the sort of knocks and bashes that you can expect it to encounter? Being built into a polycarbonate enclosure certainly helps here; the material is very strong but ever so slightly flexible, allowing it to absorb minor bumps and thumps without denting or breaking. In addition, the front panel is recessed into the cabinet, ensuring the controls do not protrude beyond the front edge of the enclosure and this is very effective in protecting the controls from being damaged or broken during transit. The AE72G uses standard nickel coated jack sockets throughout. Not only are these tough and durable, they are also easy to source and replace should any of them wear out. Some thought has gone into the positioning of these connectors; all front panel connectors are towards the bottom of the unit and, unlike on some mixer amps, are completely clear of the mixer's controls. The dedicated pre-fade monitor buss for feeding to on-stage monitors is a worthy inclusion on the AE72G. There is no built-in power amp for this buss, so you will need a separate monitor amp or a powered monitor, but it is an important feature that is all too often omitted from small mixer amps such as this. Although the AE72G has no built-in effects (despite the manual referring to such), it does have an external effects loop. This is provided on a single TRS jack socket so you will need a stereo-to-dual-mono Y lead to make use of it. The signal at the tip is the Send, whilst the Ring brings the return signal back into the amp. This arrangement means that the effects buss is mono only. The additional stereo auxiliary input is also a welcome inclusion (albeit with a misleading label: Instrument) and offers some interesting possibilities. As well as the obvious uses, such as connecting a synth or stereo effects return, this input would be ideal for bussing in the line signal from a preamp or submixer - perhaps even a second AE72G - thereby extending the number of inputs and channels in your PA rig. The global seven-band graphic EQ offered by the AE72G provides a decent amount of scope for tuning your PA to a room or venue. The frequency bands are sensible enough - 100Hz, 200Hz, 500Hz, 1kHz, 2kHz, 5kHz and 10kHz - but not necessarily as 'musical' as they could be. For example, the 100Hz band is slightly too high, and would be more effective at 80Hz, whilst in the mid range we'd have preferred to see 1.2kHz and 2.5kHz bands. That said, if used thoughtfully and in conjunction with the channel EQ, a wide range of sound-sculpting possibilities can be achieved. Above each EQ band's fader is a red LED to indicate which, if any, frequency bands are being over cooked. This is a useful feature, but the LEDs seem to be somewhat on the conservative side, flickering into life well before any audible overloading occurs. The AE72G is a fine little PA amp. It offers a useful range of connections - the dedicated monitor buss being particularly welcome - and the sound quality is good. The graphic EQ is an invaluable tool and, when hooked-up to some suitable speakers, the 2x100W power amp can shift a lot of air, easily providing enough oomph for most pub and small club gigs.